Pittsburgh is uniquely positioned for creating innovations to improve human performance. Pitt boasts leading clinical and research programs in the realms of sports medicine injury prevention , physical activity and weight management , neuroscience, rehabilitation, information science, mechanical engineering, clinical and translational science and more. When combined with elite collegiate and pro athletic programs, the region is poised to accelerate the development and commercialization of innovations that can benefit advanced athletes and enhance wellness in general. To stimulate cross-campus collaborations in the area of human performance, the Pitt Innovation Institute the Department of Athletics, the Clinical and Translational Science Institute, the Office of the Provost and the Office of the Senior Vice Chancellor for Research have joined forces to present the Performance Innovation Tournament. The Performance Innovation Tournament is designed to address problems facing athletes, their coaches and trainers. Innovations that enhance training, reduce injuries, increase physical and mental strength and endurance, and ultimately improve human performance will be considered. The expectation is that solutions developed through this program will have a broader application to people of various ages and physical abilities. The Performance Innovation Tournament will award a total of $150,000 to innovative ideas for improving human performance in athletes. First place will be awarded $80,000 and four season tickets to the upcoming Pitt football season and second place will be awarded $70,000 . These awards can be used to develop prototypes and conduct technology testing in a real-world athletics environment. All award winners and runners up will also be provided enhanced connections to resources on campus and in the region to help advance the potential of their discoveries. Deadline to apply is March 14, 2018. Click here for information and to apply. Semifinalists will compete in a multiple round “pitch” tournament that will occur on April 11, 2018. “The Pitt Athletic Department is committed to providing the most advanced training and care available for our student athletes. We are excited to partner with the talented researchers on campus to develop solutions for improving athlete performance across multiple dimensions and disciplines,” said Heather Lyke, Pitt’s Athletic Director. “Having world class clinical competencies and powerhouse research capabilities at the University of Pittsburgh creates endless opportunities for collaborative problem solving. 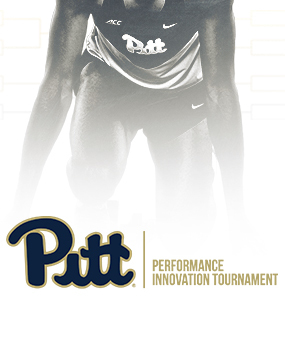 The Performance Innovation Tournament adds the element of solving issues for athletes in the weight room, on the court, in the pool and on the field by developing and iterating on new innovations and tools for improving performance,” said Rob Rutenbar, Senior Vice Chancellor of Research. Innovations to be considered could include the following.